I'm quite lucky to have family around me that are so passionate about good food. My brother in law has been working for years in a very well known Italian restaurant in Montréal. He's in the front of the house but the family who owns the restaurant runs it like an extended family and the love of the food is pervasive. That means that JL feeds his family rustic, real and nutrious Italian food and loves doing it. One of my favourite Italian foods is Gnocchi, real pillow soft, light as air Gnocchi. 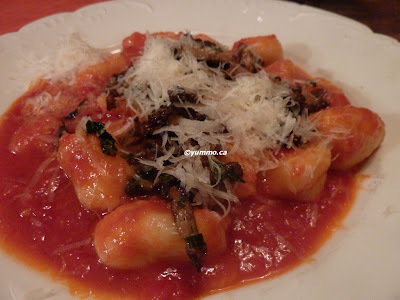 When we were in Montreal visiting, JL out of nowhere announced he had bought some potatoes because he was going to try to make Gnocchi the way he'd seen at work. That means, NO EGGS. The old fashioned, authetic Gnocchi is just Potatoes and Flour. Mind boggling as it may seem, it's true and they were fabulous. The caveat is that because of how delicate they are, you cannot make ahead or store or you will have a container full of mashed potatoes. Key here is obviously the right potato. YOu need fluffy potatoes because so a Russet would work best but you can experiment. Yukons are probably not the best for the very quality I love them, they are waxy and heavy. Serve with a light homemade Pesto or light Marinara sauce, simple, Tomatoes, Garlic, fresh Basil and Olive Oil. Peel and boil the Potatoes until fork tender. Drain off almost all of the water and reserve some as needed. Mash. Season, taste. Turn out on a VERY floured surface. I mean pour half cup of the flour out on the counter. Work the Flour into the Potatoes like you're kneading dough. Depending on your counter space, you will probably need to do this in batches. You want it quite soft but not falling apart. Knead more flour or water in as needed. Keep well covered in Flour so it doesn't stick to your fingers. Roll into cigar sized rolls and cut into 1 inch pieces. Bring a big pot salted water to a boil but not a vigourous boil. 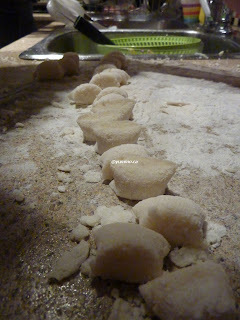 As you cut the Gnocchi into 2 c batches, dump them into a medium sieve and shake lightly to get rid of too too much flour and them dump into the water. BECAREFUL of splatter. Lift out with a slotted spoon into a lightly oiled dish with a slotted spoon as the come to a float. When you've cooked it all, toss gently in a nice Basil Marinara sauce. Serve with some REAL Parmesan. MMMMM Pillows of yummoness. My Sushi Marathon continued the next day during my work visit to Vancouver. I ordered Sushi for lunch but since we were working through lunch I had to restrict my radius to a couple of blocks. I ordered from Junsei out of convenience really. My favourite go to lunch place was a block outside the 2 block limit :^D. Funny thing was that I had passed it the night before when I landed late and had that bad Sushi at Toyama. I didn't go in because it looked like they had closed off their Sushi counter. They have a full Japanse menu and it appeared that only the back main kitchen was running. I've eaten there after the Vancouver film festival a while back as well but this was my first lunch take out. I ordered a simple assortment of Nigiri and a California roll with some Miso. I originally put the Miso aside since I didn't want to be slurping it during the meeting but after having a taste, I finished it off. The California was nice, simple nice, not too much rice. Not bland like the fast sushi joints can be and not too mayonnaisey. The Nigiri was suprisingly good. It was cut very well, with no rough jagged cuts and the Salmon was not too fatty, Yellowtail was yummo and the Shrimp was very fresh. I'd return but Bay is still my favourite for quick lunch.... mmm spicy Tuna! I had to pop into Vancouver for work so that meant 1 thing apart from the work.... stocking up on Sushi. I had it all planned as to where I was going to eat when I landed but alas, and yet no surprise #Westjet was late and my Taxi driver got lost so I had to make a quick call as to whether I would order some overpriced salad from room service or take a walk. I opted for a quick walk with the hope of sushi open somewhere. I popped over the Toyama when I spotted their neon sign. I used to work nearby but since it's an 'all you can eat' place, never had occasion to sit that long for lunch during the work week. I wasn't even sure they had take out. 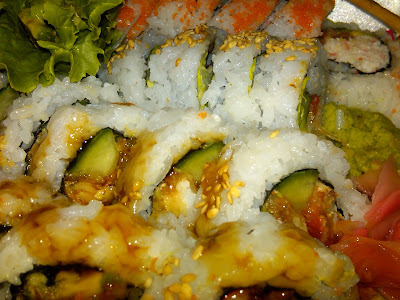 I ordered a Veggie Roll, a Spider Roll and a Alaska Roll to go with a Miso Soup. It took longer that I would have thought considering it is an 'all you can eat' and the chefs are usually constantly churning out food. But the wait staff was so airy fairy. It was hard to catch one and when I did, it looked as if I were interrupting her very important task of rearranging the receipts into neat piles behind the counter. Then when my food was made, it sat at the Sushi counter for at least 10 minutes before the girl at the cash sauntered out from the back and fetched it for me. I was very tempted to grab the package myself. I mean really, three other staff walked by the counter but ignored it because it was not their table and opted instead to wander around with the teapot. I returned to my hotel room ready to dive into some fresh Sushi which is not that ubiquitous or reliable in Toronto unless you go high end. The Miso soup was fine but a bit watery. There was a decent amount of Kelp and Tofu though. The Sushi was TERRIBLE. No ifs ands about it. The Rice was mushy and flavourless which was doublely a shame because there was SOOOOO much of it. The Veggie roll was 75% Rice. It was a sushi roll of Rice. The Spider roll was fine once I took off most of the rice. Some of the Crab was a tad 'funky'. I left most of the Veggie Roll behind untouched. Very dispappointing start to my Sushi marathon.